This little baby went to market... and she had a Craft Guerrilla Tattoo Heart brooch! A very talented mummy indeed. Send us your photos of your finished craft pack projects and we'll feature them on the blog. 93 feet east 5th of May! Tuesday the 5th of May see our first Cloths swap party at the Pink Bar in 93 Feet East. It's all keeping to our ethos: recycling, crafting and enjoying the process (that's where the alcohol comes in) Entry is free but it costs £5 to participate in the swap. You'll need to bring at least one item and up to 5 maximum in clean and good condition. You then have an hour to look,try and think about what you'd like to grab from the washing line. Once we give the go ahead all you lovelies can bun fight each other for coveted garb! Now,now, we don't really want bun fights but if we need to we'll come up with a tie break...possibly an arm wrestle for a frock?! So clothes, accessories,shoes,hats,bags are all great just remember that they need to be clean and in pristine condition. We'll then help you fox it up or teach you the basics like hemming and applique. Guest DJ's plus the usual Craft Guerrilla DJ's, a selection of limited edition craft packs and please bring your own projects! Come enjoy the creative atmosphere and mingle with fellow crafters in the Pink bar! From 8 pm to 11pm. The increasing interest in our little venture is amazing and we'd like to share it with all you talented folk! Publicity has increased and so has web traffic. The more attention we get the better it is for all our craft "soldiers". So my little friends you know how it goes...strength in numbers and if you'd like to feature on the Craft Guerrilla "featured sellers gallery*" drop me a line but if you'd like the chance to WIN a years free listing here is your chance to do so you lucky people! FIRST 5 DESIGNER MAKERS THAT CONTACT ME AND ARE SUCCESSFULLY SELECTED WIN THIS FAB PRIZE! E mail me with a few images,a brief description of your work and why you'd like to be part of The Craft Guerrilla Featured Sellers Gallery. Competition closing date: Sunday 10th May 2009.Be quick though,we know how all you crafty people love winning stuff! All winners will be contacted on the closing date,names will be posted on the blog and your link will be up on the web site beginning of June 2009. Good Luck. It's your chance to show off your handy work to a captive audience. We don't take commissions on any of your sales because it goes directly to you! We just provide a link from us to you. You send us up to 4 images (jpgs),a logo and your http address(either web site,blog etc) and we'll do the art work...ie put it together so it looks nice and hopefully you'll get a few more hits and fingers crossed a few more sales! All we ask for is a yearly fee of £25.00. This would be for upkeep,maintenance,web site,domain fees etc and to upload information. This feature will provide a direct link to your own web site/shop/blog therefor sharing our web traffic and getting all the Craft Guerrilla designer makers a little bit of well deserved attention! *Subject to pre approval and pre selection.Please note that all items must be hand made and meet our high standards of quality,design and originality. E mail a few images of your work and we'll let you know! Open to all London based designer makers. 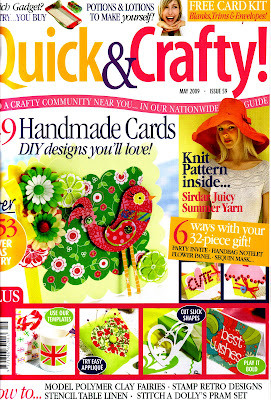 Membership is only available to designer makers which have previously participated in our events.No membership required for the "featured sellers gallery"
We've been featured in May's Quick & Crafty magazine...Hooray!!! We're chuffed here at Craft Guerrilla Towers and we can't stop smiling. What a great honour it is to be featured along side other trail blazing craft groups like the Glasgow Craft Mafia, East London Craft Crunch and others. Go get your copy and help support British craft! You'll find an interesting article about UK based craft communities,groups and collectives and we're on it! Just goes to show that hard work does pay off and that we're getting some where! and the relaunch of our monthly summer craft markets in Walthamstow! And if that wasn't enough we'll be pitching our tent at the Indie Tracks festival for a summer craft workshop...Rock N Roll, we're bringing it to the kids! We've also been featured in a few web sites and magazines so fingers crossed there will be others inspired to start up their own Craft Guerrillas. In fact we have one ready in the side lines and our crafty sisters are ready and waiting to get things rolling in June. So we hope you can join us a t some point. The Castle 15 Grosvenor Rise East Walthamstow Village E17.Craft projects,in house tutors,guest DJ's,Vintage board games and more! Don't forget those Guilty Pleasures-records you love to hate and we'll spin them! Cloths swap...a Swaperama at the Craft Guerrilla washing line! 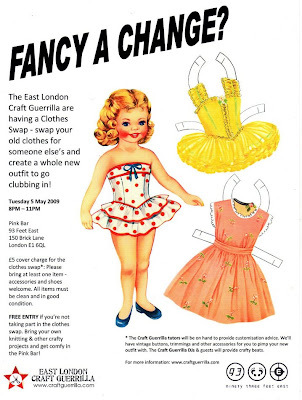 Just in time to help you spring clean your wardrobe the Craft Guerrilla are holding a clothes swap at 93 Feet East on Tuesday 5th May. Boys and girls, fling open your drawers and bring all those clothes, shoes and accessories that you don't wear anymore (although please make sure they're clean and in good condition) and swap them for new ones! The Craft Guerrilla tutors will be available to help you pimp your new clothes with vintage buttons and other trimmings. 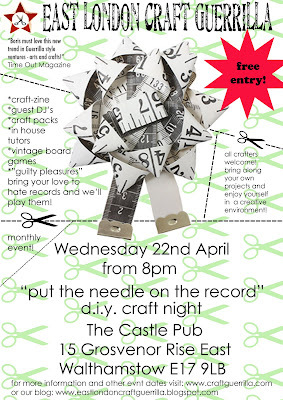 As with all our DIY Craft Nights, please feel free to bring your own projects. Foxed by a knitting pattern? Got your garter tangled with your stocking stitches? Running stitch run away with you? Want to learn how to darn / knit / crochet? Ask our tutors to help you out! £5 cover charge if you're taking part in the clothes swap or FREE ENTRY if you're bringing your own projects. Please get there with your clothes by 8PM as the first hour will be spent hanging them up and eyeing up your potential swaps! Please bring at least one item to swap per person. As always the Craft Guerrilla DJs & guests will provide some crafty beats while you knit, sew and pose in your new clothes. Spring in to spring in crafty style! Charity Crafternoon " Fair Pensions" aid! Here's another great Craft event by our crafty mates...Crafty Creatures! 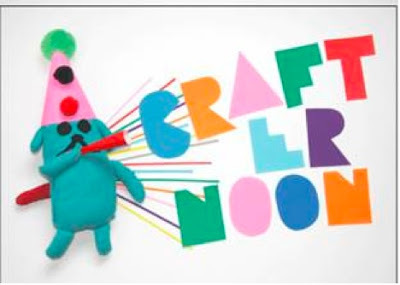 On the 18th April Crafty Creatures launches its very first "crafternoon" extravaganza at the St Pancras Church Hall. This is your chance to create your very own T Shirt Dog, pig out on the finest range of homemade cakes, drink tea until you turn into a tea bag and listen to some very fine music. What more could you want? Roller skating hostesses... ok then. Crafty Creatures is the clever guise of the charity FairPensions (full notes on charity below) and the all profits will go directly to them. This event also aims to raise the profile of FairPensions, who campaign for the money you invest in your pension to be invested responsibly and ethically. Keeping in line with the ethical ethos of FairPensions we will be encouraging attendees to bring their oldest, most loved but well worn T shirt - which they don’t mind cutting up and transforming into a stuffed dog - to this event. Whilst your creative juices are flowing our lovely hostesses will be at your beck and call serving up homemade cakes and a wide selection of hot drinks. If you love winning prizes (and let’s face it who doesn’t?) then our raffle will tickle your fancy. 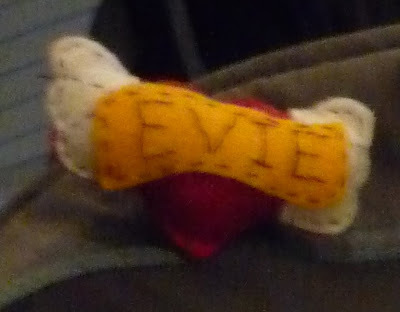 Take pleasure in knowing that you are helping to save the planet whilst creating your very own piece of dog shaped art. This is a fun filled day that will leave your heart and mind feeling satisfied and your stomach filled to the brim. Come along to St Pancras Church Hall and let out your inner crafty creature. FairPensions is supported by some of the UK’s leading charities (including ActionAid, Oxfam and WWF), the largest trade unions in the country (CWU, GMB, Unite and UNISON) as well as thousands of individuals. FairPensions is the operating name of Fairshare Educational Foundation, which is a company limited by guarantee registered in England and Wales (number 05013662) and a registered charity (number 1117244). "Dreamspace gallery" - a design gallery in Clerkenwell are currently looking at putting on classes in knitting, crochet, card making and flower arranging amongst general craft days and are looking for teachers. Fees for teachers will be available. Please discuss with event organisers. All The Fun Of The Fair is a little knitting shop in Kingly Court near Carnaby Street, London.They're currently on the hunt for quality designer makers to supply their lovely boutique with yummy hand made goodness! "We sell a range of yarns, knitting supplies, modern and vintage knitting patterns, cute buttons, ribbons and other haberdashery essentials, plus lots of hand knitted and hand crafted goodies. We offer knitting, crochet and sewing classes, and we support Fair Trade and UK designer-makers and crafters. We are always looking to stock handmade products in our store." Craft Guerrilla have been invited to host a monthly D.I.Y. craft evening at 93 Feet East,in the heart of Brick lane in the ever so fab "Pink Bar"
We're so excited and we can't wait for the 5th of May! The Craft Guerrilla gals will be there from 8pm - 11 pm helping all you crafty people get into the creative groove! Even complete novices are encouraged to participate. You might find you're a natural crafty super star! Guest Dj's, d.i.y. craft kits,in house tutors - should you need a helping hand, impromptu knitting lessons- "getting you hooked on knitting" and a CLOTHS SWAP/Clothing alterations and beautifications! Yes we'll help you fashion those tired old clothes into fab new clubbing apparel! it's stitched and pissed at its best! The organisers of the G20 Climate Camp in the City are taking action on climate change and are taking to the streets in protest to show how a gathering of people can make a change. They have asked that people come out to ‘transform’ the financial district with theatre, music, and craft and hopefully have a peaceful but powerful protest. Craft Guerrillas this is your chance to get a little knitting anarchy started! Why not knit a few "bombs"(made with lots of love,of course,we are a peaceful bunch! ), tag some lamp posts, trees,etc...lets knit "the man" a big soft, woolly HUG! Love and peas to you all!